I have always been involved in the agriculture industry in about every point of my life in some little way. My dad got out of farming to quick for me to be actively involved on a daily basis growing up, but I still managed to steer back towards it when I stepped out on my own. I have talked over and over about the pride that comes with the industry. Even today, G and I were watching You Tube videos about Windrowers because I bought him one when I had to pick up parts at John Deere this morning. Which led to watching videos of custom wheat harvest from this year. It is soo cool. I highly recommend watching them. Grady loves them and could sit and watch them for hours. Back to the topic at hand, sense of pride, I will FOREVER be so proud of being part of this industry. I’ve always been one who beats the topic to death about supporting agriculture and anything that might entail. Whether that be caged chickens, GMOs, hog barns, feed lots, etc. I would fight to the end for those issues and supporting the agriculture side. However, today my thoughts and opinions were thrown a curve ball. News of a hog barn that will be going up within a two mile radius (as a crow flies) to our home and our community was introduced to me by a local farmer. He posted a letter that was sent to a resident back on September 24th. Copy of the letter sent to resident. I am very confused as to why most of the community members are just now finding out. In the letter it states that written comments can be sent to the DNR within 30 days from the date the letter was sent. That only leaves roughly two weeks to get something put together to express our concerns for our community. Seth and I have toured a hog operation owned by this same United Hog Systems. We were impressed by how clean and well maintained this facility was. Honestly, I don’t remember smelling a thing, granted we didn’t get off the bus that day as it was a drive through tour but I was very impressed. It looked as though a white two story house with a wrap around porch and a white picket fence should be placed beside it because it was that well maintained. Granted, things might have been cleaned up with the knowledge that members of the Missouri Young Farmers and Young Farm Wives was coming for a tour, but I still give the owner the benefit of the doubt. He had a very nice facility. Growing up I was involved with hogs, granted no more than eight a year. Even then we had neighbors complain about the smell of these eight gilts…EIGHT gilts. Which gets me really thinking……this barn is said to be bringing in 7000 gilts/boars and it is my understanding that those numbers aren’t including the litters. The average sow produces 8/10/12 ( I found all three numbers) pigs a litter and I have found numbers suggesting 40 piglets per year expected per sow. So lets just low ball it and say those 882 sows that they mention in the letter produced 8 piglets per litter, that would make 7056 piglets. You multiply that by 3 (Sows gestation period is 3 months, 3 weeks, 3 days- 114 days) that makes 21,168 piglets a year. 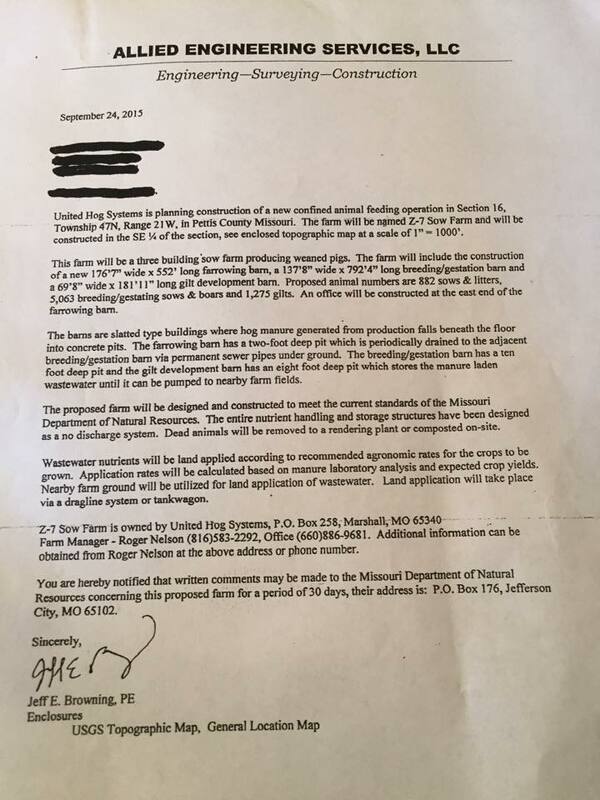 The letter is vague about the operation with exactly how those barns will work although those who are actively involved in the swine field make know exactly what they are talking about with those numbers–if so, please feel free to comment so I am able to understand. This information is from 1999 so really its a wash. That was 16 year ago. So really that number may have decreased or increased. Like I have said prior, I am always for AGRICULTURE. There are so many ag bashers out there that those in the industry have to really stand their ground about the industry and beliefs. Am I 100 percent in favor of this barn coming in to the area, honestly no. It kills me to say that because I am going against something I believe so firmly in. However, I believe with the advances in technology and knowledge, this barn will have a less ill effect on the community than most may think. After thinking about it, there are a couple other barns or operations within a 20 mile radius that I can think of and after thinking about it, driving by there you don’t smell anything. Granted my nose may be accustomed to these types of smells thanks to working for the City of Sedalia’s sewer department for two years now, however I can’t remember a time I actually smelt them. The chicken barns around here you for sure can. Tyson you for sure can….there are many nights you can smell tyson from our house and I swear sometimes it’s almost as though you can smell what type of chicken they are making that day (BBQ is what I always seem to smell). I don’t want those reading this to think I am a hypocrite and going back on my beliefs, because I am not. I simply understand both sides on this. Either way this goes, I will understand. The fact is America has to eat. Most Americans gripe and complain about the smells, the way animals are treated, and the farmers and ranchers who raise our food. The fact is without those people and their animals all of us (except those who could live off the land themselves) would be naked and hungry. Do I understand why this man can’t put his hog barns on the many acres he owns in Saline County? Yes, he wants to save that ground for crop productivity since the dirt north of us is way better than here. Let’s look at it this way…..if this was a local farmer who we all knew and loved who was wanting to put in this hog barn, would we be against this as much? Is it because it is an outsider coming in? If Seth and I had purchased this property and decided to put a feed lot on it, would we all have the same outlook?? Before we go bashing these barns, we need to look at the big picture. Pettis County is a county I would considered based around agriculture. The people you meet for the most part have some link to agriculture even if it’s in some little way. We can either stand behind agriculture and show the community the pride and compassion we have for the crops and livestock we raise, or we can turn around and bash those that are trying to do what we are, make a living doing what they love. Am I concerned that this may be a way for United Hog Systems to get their foot in the door and to continue to bring more barns to the area…YES, but that is no different than what Tyson or Cargill has done in this area before. It is my understanding that these hog barns have to meet strict regulations and guidelines, by the EPA, DNR, etc. I simply don’t know all the facts and I would assume (even though we all know what assuming does) that most of those against it don’t know all of the facts either. Until we can get the facts and find out how these barns will cause problems in the area whether it be through air quality, water table, land values, etc we can’t jump to conclusions. We think hog barns and we automatically think of the worst smell you can smell times 10 and the filth and crap that comes with it. In today’s case that’s not how it is at most operations. Most are well maintained and high tech. As I have said before, I am not 100 percent for these barns going in. If it was someone local I don’t think I would have a problem. If I knew more about the water table and how these barns may cause problems with it I may have more of a issue. I honestly do feel for those who have land that is beside this property and even those within closer proximity than where I sit. However, I also feel for the farmer. He is doing what he has to, to make another dollar. We would all do it. Money is a high demand product in today’s world and most would do whatever they could to make more. My head tells me no these barns will be bad for the community but my heart tells me otherwise. My heart has always had a soft spot for agriculture and those involved in the industry and each year as I grow another year older, my blood pumps a little bit harder for the ag industry thanks to my heart and love for something we all need, whether we want to admit it or not. So before we decide we are against these barns completely I suggest you investigate and find out a little more information if you are so concerned with these barns coming to the community. These barns may be put in and the stench will be terrible and all of you will rub it in my face and say I told you so, or we may not smell a thing, may realize this company and its facilities are well maintained and be thankful we didn’t over react. Either way, I encourage those who are against this to investigate find out more about how these barns may effect our community, but I beg you not to not only look at the ill effects but the positives as well. We can’t rule something out just because of the stereotypes that comes with any CAFO. I encourage you to look past what your head is telling you, and take in to consideration how your heart feels about this situation. My heart is for agriculture and always will be.